The Chronicle of Cultural Misandry: Despite Being the Most Privileged Class, Women Still Live With Parents Like in the 1940's. 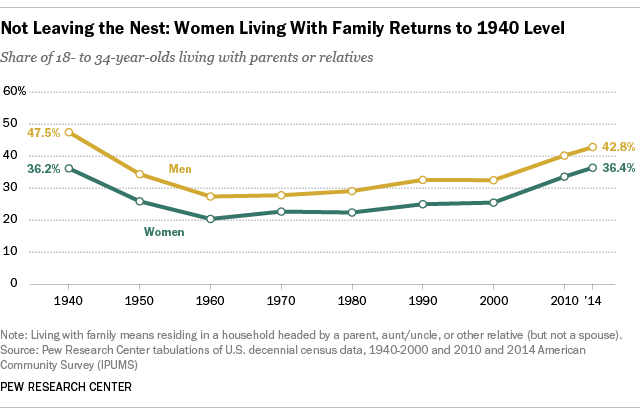 Despite Being the Most Privileged Class, Women Still Live With Parents Like in the 1940's. One of the goals of women's liberation, was to make sure women were free from the supposed constraints that the patriarchal nuclear families oppressed them with while inside their parents' home; where the father is seen as the ultimate authority by feminists- who wanted to economically and socially liberate women in order so to provide for themselves. Women are the majority of voters, hold two-thirds of the national wealth, have affirmative action in favor of them over men. are majority of college graduates, recipients of alimony and child support; and also have over 40 federal programs to make sure they get a leg up. Despite all that, women are still living with their parents just like they did in the 1940's, when women were apparently in "comfortable concentration camps" shackled by either their fathers or husbands. 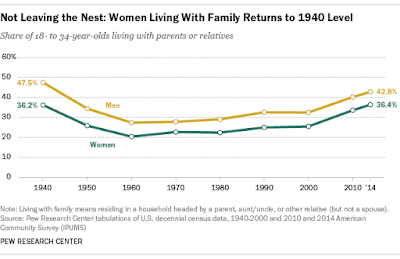 We can see that the trend is slightly greater for modern women to live with parents by 0.2% more compared to women in the 1940's; while the male percentage of living with parents went down by over 5%, despite men being overwhelmingly disadvantaged in today's society. And back to the Pew Research data, the evidence shows that women went from being 5% since the 1960's to attend college, to 27%. Women in general need to have a serious talk with the leaders of the feminist movement, because personally, I can smell a con when it comes my way.